Paris is one of those places that French residents tend to get to occasionally on various business. It's technically possible for us to get there and back in a day, since the TGV only takes 3 hours. But we usually try to stay overnight anyway and that's how we get to see the capital city. On this occasion, Antonia had a dance rehearsal for a show she will be in, and we traveled up a day early. We didn't take a camera so the only pictures we have are from her sketchbook. One of the reasons I felt we could justify an overnight stay in Paris is because of the educational potential. Antonia is currently studying the Middle Ages so the National Museum of the Middle Ages was an obvious choice. It is a less well known choice internationally, but it is very cute if you like medieval stuff (I do), and it is not overwhelming in size. The building itself, the Hotel de Cluny, is a lovely late medieval house, and original features can be seen in several of the rooms. The collections include tapestries, stained glass, carvings in stone and wood, a few paintings and everyday items. The highlight for me is definitely the tapestry collection, including the stunning and famous Lady with a Unicorn series. Medieval art is also great for children because it has a lot of things they can relate to. The tapestries show animals and wild flowers which they may be able to identify, a lot of the narrative art is told in ways they can relate to and many of the stories, Bible stories for example, will be known to many western children. There are gorgeous dresses and chivalrous sword fights of the kind that inspired Narnia. Even when the people of the Middle Ages got down to depicting concepts like the senses or the arts, they did it in a way that children can relate to. The museum also has a medieval garden which is a lovely thing to see if you've never been to one before, but it wasn't open when we were there in January. 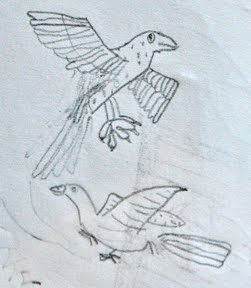 Antonia and I spent quite a while examining a personification of Arithmetic, amongst other things, but what she mostly did was copy animals from the tapestries in her drawing book. She loved this aspect of medieval art, though she was pretty turned off by graphic depictions of the Deposition of Christ. 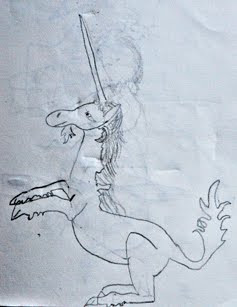 Antonia's drawing of the unicorn, of which she is very proud. Even Mike enjoyed this museum, which he went round with audioguide in hand. I've specialised in the art history of the period so of course I loved it. Antonia said it was the best museum she had ever been to, because 'it has actual stuff in it'! We were late leaving and had to rush our lunch and dash madly across town to make it to her rehearsal.